independent transport videos are proud to present seven short films made by the renowned transport photographer, Malcolm King, during the centenary celebrations for Blackpool trams in 1985. Malcolm shot the films on 8mm sound cine film of which we have kept the original sound throughout, although there are some parts where the sound is missing so we have left it silent rather than dub sounds that might not be appropriate. We are sure this will not detract from the enjoyment of this unique film archive. 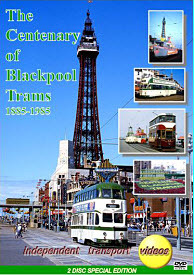 The films cover a number of events held during 1985 all featuring the famous Blackpool tram fleet. As you would expect, the night time filming covers the famous Illuminations and the many trams dressed up with hundreds of coloured light bulbs! “Blackpool Trams 100 Years” filmed on 16th June 1985. “Fleetwood Transport Festival “ filmed on 14th July 1985. “Blackpool Countdown to Centenary Day” filmed on 28th September 1985. “Centenary Day – Part I” filmed on 29th September 1985. “Blackpool Trams 100 Not Out – Part II” also filmed on the 29th September 1985. “Last Night on the Prom” filmed on 27th October 1985. So be prepared to be taken back in time with this fantastic film archive of a very special event – The Centenary of Blackpool Trams. Duration : 170 minutes (approx).